It’s no secret that the Crossroads of America is packed full of unique places to grab a drink, but some locations are easier to find than others. From tucked away cocktail lounges to concealed tiki bars, these are the 10 best speakeasies in Indiana. Goodfellas Pizzeria is well known for New York-style slices the size of your face, but there is more to this 1920s-inspired restaurant than meets the eye. In true Prohibition-era fashion, hidden in the back of the restaurant is Wiseguy Lounge, a fittingly named and fully equipped speakeasy. The bar includes a rotating tap, a list of unique 20s-inspired cocktails (like the Marilyn Monroe! ), and a plethora of bourbon, ensuring that there’s a little something for everyone. Stumbling upon this speakeasy will send you back in time, and with its cozy leather sofas and relaxed setting, you may never want to leave. Tucked away on the first floor of the LaSalle building in downtown South Bend is a "Prohibition meets steampunk" speakeasy called, the Hideaway. Appropriately themed, the bar compliments the historic LaSalle Hotel built in 1921 (which today has been renovated into apartment space.) The bar is not visible from the street, and due to no signage, easy to overlook. The quaint setting features a stocked bar with signature cocktails, mainly consisting of whisky or gin to stick with the speakeasy theme. The Hideaway also offers craft beer on tap, one in which has been specially brewed for the bar, named, Hideaway Hooch Amarillo IPA by South Bend Brew Werks. If you’re looking for a cool and quiet location to grab a drink in South Bend, this is definitely the place. Massachusetts Avenue is bursting at the seam with hidden gems, and Libertine Liquor Bar is no exception. When walking along the Argyle on Mass Ave, you will find that it’s home to a small community of upper level living arrangements and street level retail space. Among the various first floor shops, a green awning bearing the number 608 can be found. To the naked eye, this space looks like nothing more than a basic space with no indication of any unique qualities, that is, until you notice the staircase leading to the lowest floor of the building. This intricately hidden speakeasy is the underground oasis of Indy, offering an intimate atmosphere, artsy craft cocktails, and mixologists that really know their stuff. With an ever-evolving menu full of unique drinks and fun snacks, you never know what you’re going to get, making Libertine one of the best speakeasies in Indiana. Hidden smack dab in the middle of downtown Warsaw is Oak & Alley, a discreet location that will make all your craft dreams come true, if you can find it, that is. As the name states, this speakeasy is actually located down an alleyway, so you’ll have to do some searching before you can enjoy its great selection of beers, cocktails, and did we mention their massive list of bourbon? If that’s not enough to spark your interest, Oak & Alley is also well known for their sweet potato fries and 11 craft burgers, most notably, their "rotating experimental burger," the Traveler. If you happen to find yourself in Warsaw, this is a speakeasy definitely worth looking for. 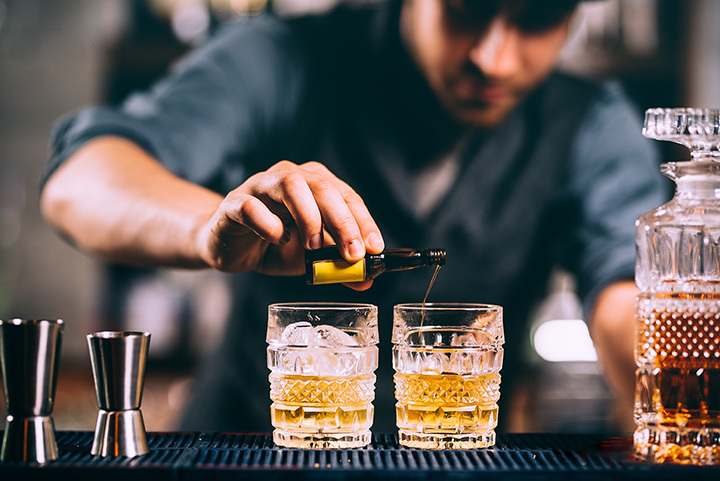 Tucked away on the southeastern edge of downtown Indianapolis sits Hotel Tango, the first artisan distillery to pop up in the city since Prohibition, as well as the first service-disabled veteran-owned distillery in the entire country. This speakeasy has some serious rustic farmhouse vibes going on, with a large stone fireplace, tall copper stills, and a complimentary popcorn machine for snacking. The location has two large bars where you can order homegrown, handcrafted cocktails from their seasonal menu that just keeps getting better. With a distinct dedication to making "farm-to-glass" liquor and cocktails, Hotel Tango is a speakeasy in Indiana kicking it old school and keeping it real. This is a newer addition to Indiana’s speakeasies, but one of the most notable. The Inferno Room is a total mystery, as it has no windows, you won’t know what you’re walking into until a doorman grants you access inside. Stepping in the bar feels like you’ve just been transported to some sort of tribal spirit house, as the dim red lighting and walls lined with bamboo, skulls, and authentic Papua New Guinea artwork exude an ambience that can best be described as tropical grunge. The Inferno Room specializes in unique bites (you MUST try the yuka nachos) and beautifully decorated tiki-inspired cocktails. If you’re looking for a speakeasy that’s as delectable as it is intriguing, look no further. If you’re from Indianapolis, you likely know about St. Elmo Steak House and their world famous shrimp cocktail, what many don’t know, however, is the secret spot above the restaurant. On the second floor of the building sits 1933 Lounge, offering all the swank that St. Elmo demonstrates, but in a more laid-back, private atmosphere. This speakeasy is an intimate place to lounge by the fireplace, observe the unique decor, and listen to some smooth live music, all while sipping on one of their signature drinks, like their signature Elmo Cola or the Cucumber Gimlet 2.0. The best part? 1933 Lounge also offers that coveted shrimp cocktail! What are you waiting for? Bloomington is home to Indiana University, whose thriving nightlife has contributed to a plethora of neat bars popping up over the decades. One of the most unique, however, is the Root Cellar, a bar hidden away in the lowest floor of FARMbloomington restaurant off Kirkwood Avenue. This speakeasy is dedicated to "keeping Bloomington strange," and offers an upbeat vibe that differs from many of the other locations on this list. The Root Cellar is not only a great place to sit back with a drink or two and enjoy the quirky scenery; it is also a great place to dance as they frequently have live bands and DJ’s. If you want to sneak away from the college scene for a bit and dive deep into a funky and exciting subterranean speakeasy, this is definitely the place. Hidden up on the second floor of the historical City Market is Tomlinson Tap Room, a low-key speakeasy that discreetly overlooks the hustle and bustle of downtown Indianapolis. This bar stays true to Hoosier culture by offering Indiana-centric beers only, and with so many local options, bartenders will actually provide you with a "passport" so you can keep track of what beers you have tasted. With 19 taps that are constantly rotating, you can enjoy all that the Indiana craft beer scene has to offer at one convenient location. Why go anywhere else? Opening it’s (somewhat hidden) doors last year, this bar has earned itself quite the cool reputation in Kokomo. Described by many as Kokomo’s hidden secret, this bar located downstairs below Wings Etc. is certainly worth checking out. While beers, liquors, wines, and other spirits on the menu, nothing is more popular than their defying martinis. Their rustic interior, complete with stone walls, vintage wooden fixtures, leather couches, and more, is enchanting enough to leave you wanting to come back again and again.